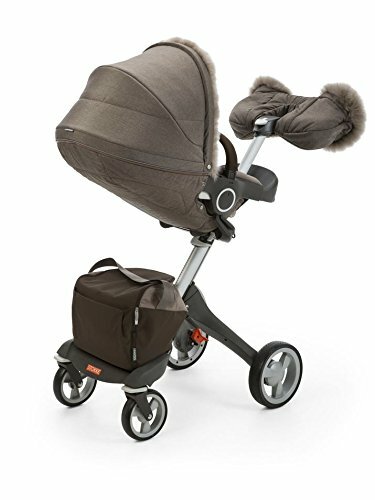 Stokke Xplory Winter Kit - Nougat Melange by Stokke at Baby Stroller Car Seat Combo. MPN: TZ-497. Hurry! Limited time offer. Offer valid only while supplies last. Stokke XPLORY Winter Kit - PurpleKeep your baby warm.The Stokke Xplory Winter Kit is designed to keep your baby warm in the most testing climates. Sheepskin rimmed hood and hand muff for extra warmth. Insulated hood and storm cover protect baby from all weather. Designed to fit perfectly with the Stokke Xplory V3 seat and carry cot. Hand wash individual parts separately at moderate to warm temperatures. Shopping bag and diaper bag- wipe with clean damp cloth.